It what may have been their most emotional match to date, the young American national team saw themselves fall victim to a stoppage time goal which ended hopes of moving through to the semi-finals. Effectively the 3-3 draw with El Salvador, while thrilling, ruined hopes of seeing the American youngsters take on the world's best. The match was certainly entertaining with six goals on the night and the perhaps the most amazing display by Freddy Adu we've seen to date. He carried the squad through long stretches of the match and his efforts served to remind us of the player we all know he can be. Criticisms can be spread around the squad, but in last nights match Adu was the shining star on squad that peaked in some moments and crashed in others. The United States got off to a strong start, scoring a goal in the first minute. Brek Shea streaked down the left and sent a ball in to Terrence Boyd who volleyed it into the back of the net. The US seemed nearly stunned with themselves at the quickness of the goal, but eventually succumbed to youth and inexperience as poor defending allowed El Salvador back into the match. An injury to Bill Hamid and poor defending by multiple players on the US back line, who had been suspect since Canada, led to El Salvador scoring two unanswered goals. Perry Kitchen and Kofi Sarkodi can both be faulted for the goals allowed in the first half. Sarkodi allowed himself to be out-jumped for a ball and Kitchen's inattention to a loose ball allowed Andres Flores to beat Bill Hamid. While the back four certainly were at fault for each goal, the midfield did them no favors. Multiple times throughout the match they failed to connect or even defend coherently. It was as if for long stretches of the match, they forgot one another's names. Watching the Americans play was akin to flipping over a coin. The defensive aspects were completely different than the offensive ones. 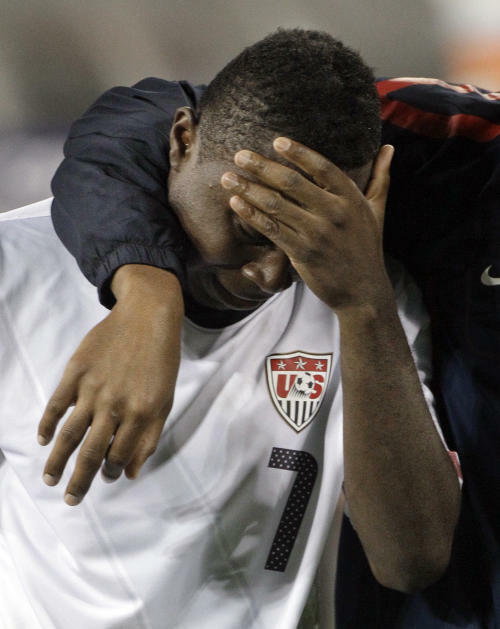 Freddy Adu was leading the charge for the American attack and leading it well. His efforts in both halves allowed the Americans to come back from a goal down and retake the lead 3-2 through the dying minutes of the half. That is until the fourth and final minute of extra time when another American defender, Amobi Okugo, lost track of his mark and allowed him to shoot. Jaime Alas's shot was an awkward one and substitute goalkeeper Sean Johnson should have done better. Rather than deflect it wide or smother it, he punched it skyward, only to see the ball bounce unceremoniously into the American goal for El Salvador to tie. With the goal, the game ended 3-3 and the United States did not qualify for the Olympics. The match was an emotional one, but ultimately it showed the paramount weakness in the American game: managing a match. The roster the United States put out was a talented one, with nearly all professionals. However, they suffer the same issue as their senior counterparts. Few or none seem to have the ability to recognize what needs to be done at various stages of a match to effectively secure a win. Managing minutes on the field by players. Last thought for the night: Systemic changes can't be imposed from the top down. Need to be from the ground up. Claudio Reyna is working on it, but these things take time. Unfortunately, there is a World Cup to qualify and compete for in 2014... We'd better get on it. this was BEYOND painful, but Adu was really impressive. This will also be his first healthy year back in MLS. could be a big year for freddy and his future with the USMNT. the little i saw of gyau was impressive too.